Texas Christian University Press, 9780875655840, 40pp. Texas Chili? Oh My! has now been translated into Spanish! ¿Chili Texano? ¡Ay Dios! is a retelling of the beloved fairy tale The Three Little Pigs—Texas style! Meet Bluebonnet, Mockingbird, and Sweet-Olive, three little armadillos, as they leave Mamadillo’s home and build their own dens out of native Texan materials. But watch out for Trickster Coyote, always looking for armadillos to make into Texas Chili! 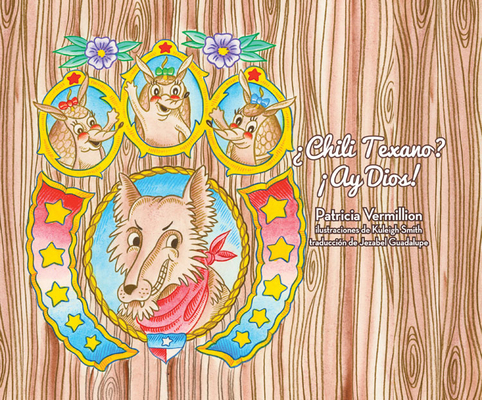 Aided by adorable and colorful illustrations that depict Texas characters, settings, plants, and natural resources, Patricia Vermillion also gets the Texas vernacular just right! Kids and adults alike will be entertained and educated on Texas symbols in this beautiful book. ¿Chili Texano? ¡Ay Dios! also includes a glossary and learning objectives to aid elementary teachers in making Texas history a fun, engaging experience for students. PATRICIA VERMILLION serves as the librarian at The Lamplighter School in Dallas, Texas. She has contributed to Mississippi Magazine, School Library Monthly, and Library Sparks Magazine. Illustrator KULEIGH SMITH attended the Art Institute of Dallas and served as director of Galeria Sin Fronteras. He resides in Austin with his wife and daughter. Translator JEZABEL GUADALUPE is a Spanish teacher at The Lamplighter School in Dallas, Texas. She is originally from Mexico and has lived in Canada, Minnesota, and Georgia.